(1) HERSTORY. James Davis Nicoll, in “Fighting Erasure: Women SF Writers of the 1970s, Part III”, continues his series for Tor.com. We are pleased to announce the following writers have contributed stories; Kameron Hurley, Paul Levinson, Dave Creek, Shirley Meier, Drew Hayden Taylor, and Allen Steele. (3) ANALOG BLOG. From a Featured Futures’ links post I learned about The Astounding/Analog Companion, “the Official Analog Science Fiction and Fact blog.” Last month they published Gregory Benford’s background notes about a piece he wrote for the magazine: “Thinking About Physics a Century Hence”. 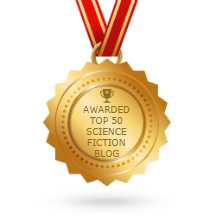 I’ve published over 200 short stories and over 200 scientific papers, reflecting a symmetry of sorts. My career as a professor of physics at UC Irvine has taken most of my working life, with writing as a hobby that has surprised me by success. So I see SF through a scientific lens, focused on plausible futures. But sometimes I just wing it, and speculating on physics a century hence is a grand leap, indeed. The mock future news report in the current Analog issue [“Physics Tomorrow: A News Item of the Year 2116,” March/April 2018 Analog, on sale now] came from a contest the journal Physics Today ran in 2016: to devise an entry for that journal in a century. I took the challenge, and produced this “story” because the physics intrigued me. Then I thought, why not try Analog? As a physicist and SF writer, both avenues are natural. Indeed, maybe writing future news items is a new way to think of SF…. Mary Robinette Kowal: I was at a conference in a round table discussion talking about automation and privilege. At some point, we were talking about how knitting, which used to be a necessary thing, became automated with knitting machines and now it is a luxury art. It’s expensive to buy wool. It takes time and leisure to make a garment. I said, “I imagine the hipsters of the future will totally do artisanal trucking.” I had more of a point but stopped talking as Story stampeded through my brain. Writers must be on social media, which means that everything, personal and professional is up for examination. How you present yourself online can affect what impression other authors, editors and publishers make of you. Stick to arguing ideas, not making personal attacks. Most likely this will not be reciprocated. That’s okay. Let them look like the jerk. Trolling is a whole other ball game. While it’s not seen as professional, some writers use it as a marketing tool (Milo Yiannopolus), which is all well and good if you publish in hotly debated subjects like politics. But in general, it creates as many enemies online as friends. Use with caution. Renowned scientist Stephen Hawking passed away March 14, 2018. But before Stephen Hawking died, he not only made some incredible scientific breakthroughs; there are also many hilarious Stephen Hawking cameos to remember him by. Whether he was supporting Monty Python, speaking to John Oliver or playing poker on “Star Trek: The Next Generation,” Stephen Hawking was a fabulous ambassador for science. “The science that made him famous”: Just in case anybody needs a review; has his misses as well as his hits. The downside of my celebrity is that I can’t go anywhere in the world without being recognized. It is not enough for me to wear dark sunglasses and a wig. The wheelchair gives me away. As the world mourns Prof Stephen Hawking, who has died aged 76, there has been a particular outpouring of emotion in China, where the visionary physicist was revered by scientists, students, the state and even boy band stars. In 1982, I had responsibility for his third academic book for the Press, Superspace And Supergravity. This was a messy collection of papers from a technical workshop on how to devise a new theory of gravity. While that book was in production, I suggested he try something easier: a popular book about the nature of the Universe, suitable for the general market. Stephen mulled over my suggestion. March 14, 1994 — Robocop: The Series premiered on television. John King Tarpinian isn’t the only one who remembered this is Pi Day – The Argyle Sweater. Off the Mark also has a subtle play on the day. Anyhow, amusingly enough, Thomas was so pumped about having Ellison work on these issues that he actually decided to go a step further and, since the issue came out on April 1st, he would do an April Fool’s prank of sorts by working the name of over 20 Ellison stories into the story! I won’t list all of them here, but I’ll do a few (the great poster, ruckus24, has all of them here). (13) MAD, YOU SAY. At Galactic Journey, Rosemary Benton reviews the newly released (55 years ago) Vincent Price film Diary of a Madman: “[March 14, 1963] Rising Stars and Unseen Enemies (Reginald Le Borg’s Diary of a Madman)”. It feels as though, no sooner had the curtain fell and the lights came up on February’s horror/fantasy gem, The Raven, that the film reel snapped to life with another genre-crossing macabre film. While last month’s movie was a light, dry and sardonic comedy with a vaguely medieval setting and a cast of horror movie icons, Diary of a Madman, steps forward with a much more sobering aesthetic. (14) SEMIPRO AND FAN CATEGORIES. Abigail Nussbaum continues a discussion of her Hugo nominating ballot in “The 2018 Hugo Awards: My Hugo Ballot, Publishing and Fan Categories”. Here’s Nussbaum’s picks to succeed her in a category she won last year. Nina Allan – Nina had a great 2017, with her second novel The Rift gaining wide acclaim and attention. She also continued to do good work as a critic and reviewer, on her personal blog, at Strange Horizons, and in the Shadow Clarke project. Vajra Chandrasekera – We didn’t see as much of Vajra’s nonfiction writing in 2017 as I would have liked–his focus these days seems to be on his own fiction and on being a fiction editor at Strange Horizons. But his writing at the Shadow Clarke site was some of the most insightful writing that project offered up, in particular this review of Aliya Whitely’s The Arrival of Missives. Erin Horáková – After nominating Erin’s magnum opus for Best Related Work, you’re probably not surprised to find me nominating her in this category. As well as that magnificent essay, Erin did other writing for Strange Horizons in 2017, covering movies, plays, and board games. Samira Nadkarni – A lot of Samira’s best work is happening on twitter, where in 2017 she made some incisive comments about works like Star Trek: Discovery or Thor: Ragnarok (she had some equally interesting things to say last month about Black Panther). In longer writing, some standouts include her review of Deserts of Fire, an anthology about “modern war” whose project Samira argues with vociferously, and of the Netflix show Crazyhead, in which she discusses the genre trope of conflating mental health problems and superpowers. Just remember – once you know, there’s no going back! (16) INFOGALATIC. Did you forget about Vox Day’s intended Wikipedia replacement, Infogalactic? Camestros Felapton hasn’t. He gives a status report in “Revisiting Voxopedia”. Actor Robert Guillaume is alive and well on Voxopedia despite dying in October 2017 in Wikipedia: https://infogalactic.com/info/Robert_Guillaume as is (for all you Swap Shop fans out there) Keith Chegwin https://infogalactic.com/info/Keith_Chegwin who on Wikipedia died in Decemeber 2017. More famous people are more likely to have their deaths recorded but it is hit and miss. (17) UP IN THE AIR. From the BBC: “Archaeopteryx flew like a pheasant, say scientists”. A synchrotron scan shows that the bones were hollow enough to allow short bursts of flight. The famous winged dinosaur Archaeopteryx was capable of flying, according to a new study. An international research team used powerful X-ray beams to peer inside its bones, showing they were almost hollow, as in modern birds. The creature flew like a pheasant, using short bursts of active flight, say scientists. Archaeopteryx has been a source of fascination since the first fossils were found in the 1860s. (18) OFF THE SHELF. Our hero: “‘Boaty McBoatface’ sub survives ice mission”. The popular-choice name was passed on to autonomous submersible operating from the officially-named RSS David Attenborough. Boaty is just back from 48 hours exploring under an ice shelf. Boaty’s handlers now plan even more arduous expeditions for the sub in the years ahead. This includes a traverse under the sea-ice that caps the Arctic Ocean. (19) FANTASTIC DESTINATION. David Doering declares, “This Miyazki-inspired ad for Oregon travel is stupeyfyingly gorgeous!” — “Only Slightly Exaggerated | Travel Oregon”. Site Selection voting tables at MagiCon. INTRODUCTION. 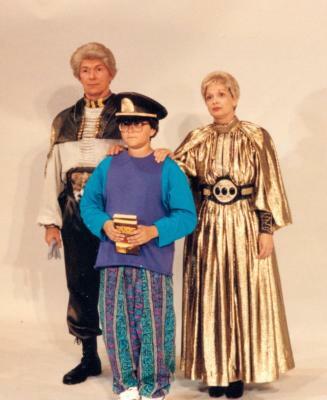 Twenty-five years ago MagiCon was held in Orlando, Florida. A great con, and I thought it would be fun to reprint the report I ran in File 770. Here is the fourth of five daily installments. The official 1995 Site Selection results were made public at the Sunday Business Meeting. GLASGOW’S SEVEN PERCENT SOLUTION. 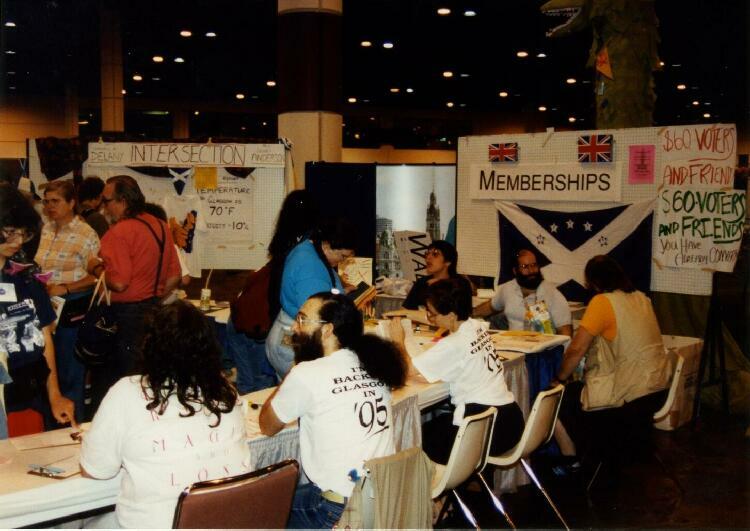 Glasgow will host Intersection, the 1995 Worldcon, having outpolled Atlanta by seven percent out of a record-setting 2,544 valid ballots. Intersection’s Guest of Honor will be Samuel R. Delany, and its Guest of Honour will be Gerry Anderson. Think about it. The committee intends to wait a year before announcing its fan guest. Venue for the con will be the Scottish Exhibition and Conference Centre and the adjacent Moat House International Hotel, from August 24-28, 1995. Debate has broken out whether the record-high vote was actually a financial setback for Glasgow. Proponents may be referring to the extra hundreds of people who joined to vote for Atlanta and having automatically become supporting members must receive convention publications at added cost to the committee. It is expected most such voters will never convert to attending members, leaving it open to question how much of their $20 fees will have to be spent for mailing costs. 1995 NASFIC BIDS. Promptly following the announcement of Glasgow’s victory, the WSFS business meeting switched on its NASFiC selection machinery. The constitution calls for a North American Science Fiction Convention tobe held in years when the Worldcon is awarded overseas, and requires that the choice of site be made in a ridiculously short time, even less than allowed for the three Christmas ghosts to straighten out Ebeneezer Scrooge. NASFiC site selection administrator Kevin Standlee set a 10 p.m. Sunday deadline for bids to be filed and waited til the last minute at a central location in the Convention Center for the I-95 in ’95 crew to complete its filing. Unlike the losing Atlanta/Don Cook Worldcon bid, the I-95 hoax Worldcon bid (“Roadkillcon”, Christopher O’Shea chair) wanted to enter the NASFiC race. Bids were also filed by an Atlanta/DragonCon committee (Ed Kramer, chair) and a New York City committee (Thom Anderson, chair). Under the rules, a bid is not adequate unless it provides a letter verifying it has facilities reserved for its proposed convention date and Standlee rejected the first I-95 filing on those grounds. According to Standlee, even a reservation for one room-night in a hotel on the proposed date would be “adequate” for filing purposes, but there aren’t many places equipped to reserve a hotel room three years in advance. Finally, at the stroke of 10 o’clock, running across the convention center floor with the same painful urgency as athletes in a slow-motion shot from Chariots of Fire, came the I-95 bidders. In hand was a one-night room reservation they had persuaded the night clerk at a DC beltway hotel to accept and fax to them. A phone link also brought Arthur C. Clarke together in public conversation with his brother, Fred, who actually attended the con and displayed treasure that Arthur had retrieved from the floor of the Indian Ocean while diving. Two 10-minute phone calls to Sri Lanka were sandwiched around showing a 52-minute video of the Minehead Space Festival, held in the brothers’ birthplace to celebrate Arthur’s 75th birthday. 20th ANNIVERSARY RANQUET: Sunday marked the 20th anniversary of a popular Worldcon event not usually reported in Locus out of deference to the laws of libel: the Ranquet. First held at McDonalds by Elst Weinstein and seven other fans who couldn’t afford $8.00 for the 1972 Worldcon banquet, the Ranquet ironically has outlived traditional Worldcon banquet dinners and typically attracts 50-70 attendees. Spurned by the nearest McDonalds, which already had more tourist trade than it needed, Elst turned to a Sizzler two blocks from the convention center. Sometime in the past 20 years, the Ranquet acquired a tradition of having pro guests of honor such as Vic Milan, Glen Cook, Steve Barnes, Lawrence Watt-Evans and George Alec Effinger. New York fans, who always turn out in force, and Watt-Evans, used GEnie to persuade Esther Friesner to be this year’s guest. 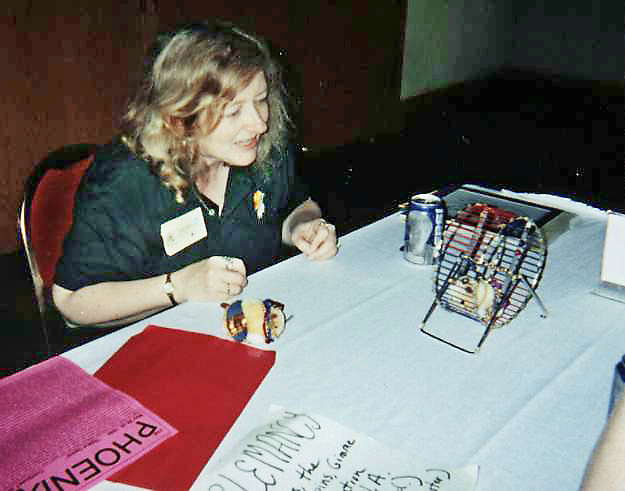 Esther Friesner seen in 1999 performing Cheeblemancy. (Just the kind of thing you’d expect from a former Ranquet guest of honor.) Photo by Keith Stokes. The Hogu Ranquet was held at a local Sizzler restaurant (almost makes you long for the bad old days when it was at McDonald’s) and featured Guest of Honor Esther Friesner. 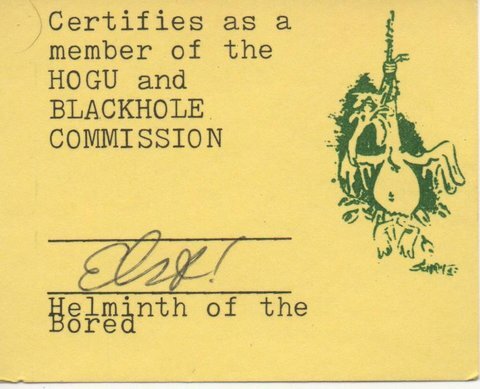 The results of the Hogu and Blackhole awards were printed in the hoax zine and a list follows. 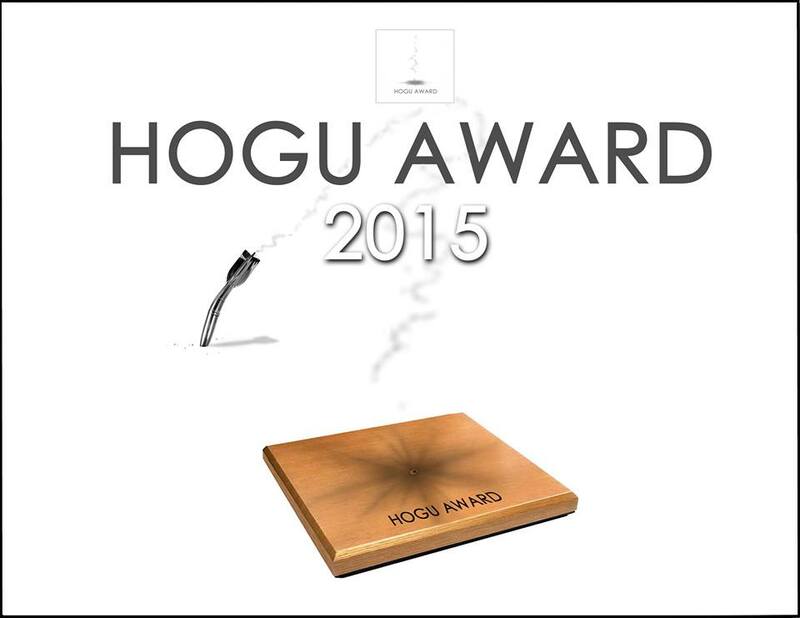 Taral Wayne’s depiction of the Hogu Award from the 2015 revival. MASQUERADE. I didn’t write up the Masquerade for my report. However, it was very successful. Best in Show went to “Heroes”, which made such an impression that Camille Bacon-Smith devoted a page to it in her book Science Fiction Culture (2000). Heroes: Duane Elms, David Chalker, Kathryn Elms. Photos of costumers at MagiCon are hosted on Fanac.org. The rest of the world can now own what Corflu Zed members had first chance to buy – a copy of Jerry’s Suzle’s TAFF Report, Trans-Atlantic Fan Fund delegate Suzle Tompkins’ account of her trip to the 2005 Glasgow Worldcon co-written with Jerry Kaufman. Suzle’s press release follows the jump. When the Southern California Medical Museum in Riverside, California holds its annual open house on Sunday, April 27 the topic will be “Medical Quackery.” Speakers Hans Davidson, M.D. and Stan Korfmacher, M.D. will tell about the pills, potions, plasters and poisons that have been deceptively presented as cures for medical problems. Well-known fan Elliot Weinstein, M.D., is co-curator of this museum. He is also a long-time collector of devices used by quacks who promised relief from all kinds of ailments. Other displays in the Museum house medical artifacts, historical photographs, medical books dating back to 1843, and a life-sized diorama recreating a typical 1900-1920 era examination room. I attended the Museum’s Lewis and Clarke themed open house in 2003 and learned a lot, including a wonderful non-medical tidbit — William Clark spelled mosquito 26 different ways in his journal but never once got it right. A page devoted to the 2003 open house includes a beautiful photo of Elst and Carole Weinstein in their best 19th Century outfits.